Sustainable Development Goals (SDGs) are the new guidelines for global development. Formerly, at the 70th UN General Assembly, the global leaders have pledged to reach 17 goals with 169 promises by 2030 and the implementation of the Framework Convention on Tobacco Control (FCTC) (Target 3A) and reducing premature death for non-communicable disease by one third (Target 3.4) are notable among the other goals. Bangladesh is also marching in this track of development. But if the 100,000 death, disability of 400,000 people and other multifaceted damages are not prevented, it would be hard to reach the 3rd SDG. 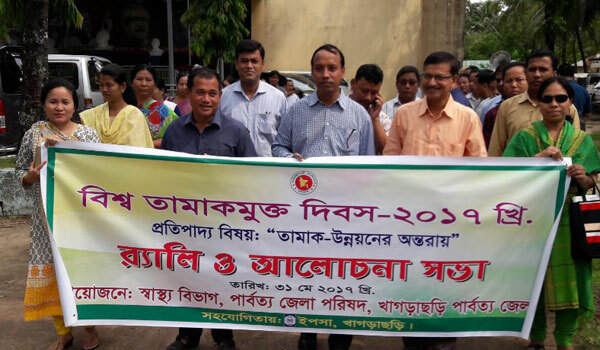 Tobacco related huge deaths and damages hinder to achieve SDG 3 – healthy lives for all. So WHO is calling on countries to prioritize and accelerate tobacco control efforts as part of their responses to the 2030 Agenda for Sustainable development. Thereby, the theme for this year 2017 is – `Tobacco- a threat to Development` which aims at encourage countries to include tobacco control in their national responses to 2030 Sustainable Development Agenda. 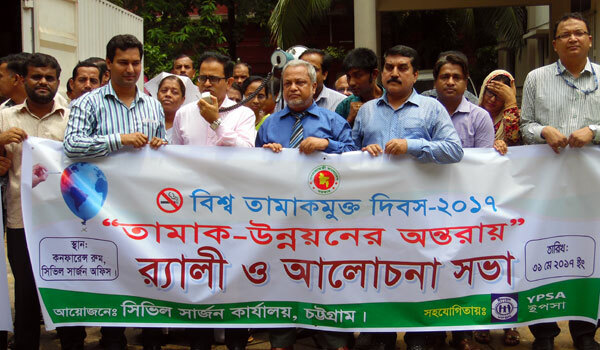 Focusing the theme, YPSA observed World No Tobacco Day’17 on 31st May in all 11 districts of Chittagong Division jointly with District Civil Surgeon Offices and District Tobacco Control Taskforces. 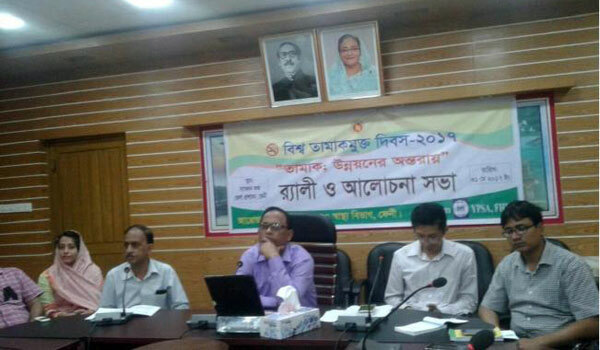 Rallies and discussion meetings have been arranged in 11 districts. Significance of the day and the theme of World No Tobacco day’17; SDGs and our duties etc. were discussed in the meetings. 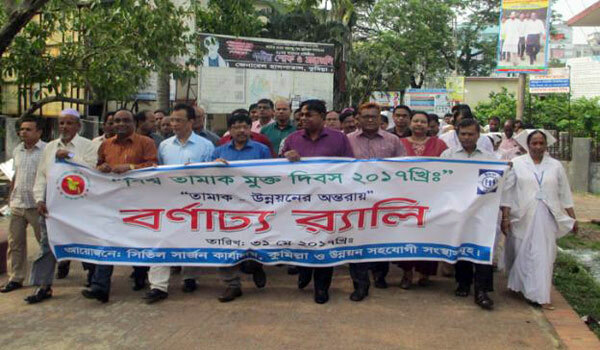 Deputy commissioners, Civil surgeons, Government officials, Different NGOs representative, Taskforce members, doctors, students, health workers, volunteers, journalists, ATMA members and smoke Free Coalition members participated in the rally and discussion meeting.